We're done with procedure number one and am happy to report that I have permission to breathe.....for now. Yesterday was my egg retrieval and I was just informed this morning that they were able to retrieve 11 eggs. Out of the 11, only 8 were mature enough for fertilization. And then out of those 8, only three are ready and, in my own words, 'in good shape' to be transferred back this coming Wednesday. They normally 'grade' the embryos before embryo transfer is done but they only tell us that before the procedure. When we did this in 2006, we also had three embryos (and therefore had a chance for having triplets) graded A+, A-, and B. If I remember and understood correctly, the grading has to do with the cell division and clarity of appearance (no dusts, no remnants). Hubby is convinced that Noah is the one that was graded A+ but I guess we'll never know. I've always thought it would've been cool if there was a way of finding out. I'm trying to be short-sighted with my prayers so as not to overwhelm God too much. For now, I'm praying that my three embryos keep developing well so that they make it until Wednesday or beyond; and that of course, at least one of them makes it all the way through, like Noah did! Every time we do this, I really realize all the more what survivors we all are! 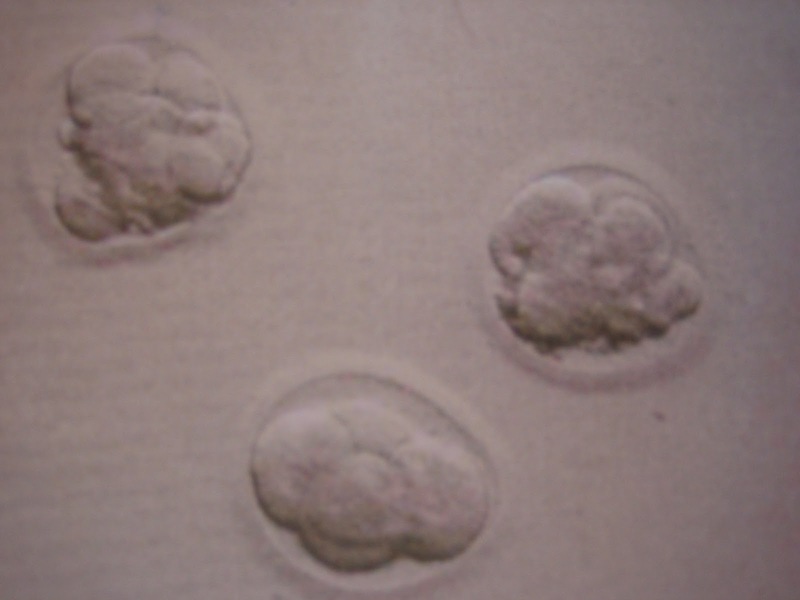 Despite the fact that I've gone through assisted reproduction and that the fertilization process itself was heavily manipulated, there are still only three good embryos out of the eleven eggs that were harvested! And then of course we all know that the story inside the womb is an altogether different story of survival. That's why my Dad used to remind me that in reality, ALL of us are indeed WINNERS. Life is indeed full of wonders. And the fact remains that science can only go so far in helping us in this endeavor. At some point, we really just have to relinquish all control and just pray. And so again....THANK YOU VERY MUCH to all you friends who continue to support and pray for us in this journey. We truly are very grateful. congratulations on passing the 1st stage, Joy! this must be such a nerve wracking procedure.... and the waiting must be anxiety-filled! Give yourself time to rest and celebrate the good news. :-) Hoping to hear even better news next time. Hugs. im holding my breath! so excited to hear the next round of good news!! Oh my !! !Now I can remember those stages/procedures. You are doing great! Sending u positive thoughts. The waiting part after the the transfer for me was major torture. Just keep ur self busy during that time and claim that it will take. You are in my prayers! God bless! Sending all our positive thoughts and prayers your way. Keep us posted! hey joy! i'm praying and hoping with you! i just read this now. i'm excited for you, aj and noah. stay with the force and may the force be with you!